As the chipper CEO of a charity called 1-877-CARS-4-SHARKS, writer and actor Brian Stack MA’88 speaks directly to viewers. Like many sketches on The Late Show with Stephen Colbert , it plays off news from the White House — in this case, recent stories about adult film actress Stormy Daniels’s tryst with Donald Trump before he was president. After Daniels had revealed how Trump had expressed hatred for sharks, increased donations flowed to shark conservation groups. That led to the mock infomercial that opened the show that night. Accompanied by a guitar-playing shark, Stack, as the straight-laced CEO Burt Ridgewood, explains the benefits of putting live sharks into used cars, despite the high probability that drivers would be eaten in traffic. The punchline features a picture of Stack, smiling, dressed as a double cheeseburger. Since the late 1990s, Stack has thrived by writing and performing wonderfully dumb sketches with some of late-night television’s biggest stars. After writing for Conan O’Brien’s show for 17 years, he joined the Colbert production team on CBS in 2015. On O’Brien’s show, Stack had indulged his inner clown, writing for one of television’s funniest comics. But with Colbert, whom he’d known from their days in Chicago with the Second City improv troupe, Stack had to recalibrate his approach. Colbert’s forte is comic commentary on the day’s news. In a media landscape where satire has found a strong footing on television, Stack moved his antic, wacky humor into the political arena. That focus has added a certain immediacy to the joke-making process, especially with a president whose Twitter blasts provide ample fodder. Making jokes for the Late Show starts early each morning after Stack’s commute into Manhattan from his home in Sleepy Hollow, about 25 miles north of New York City, to his office at the Ed Sullivan Theater on Broadway. He and members of the writing staff toss around possible bits for Colbert’s monologue or “cold open” skits like the zany shark piece. Stack’s improv skills come in handy during the collaborative writing sessions, where he and his colleagues build on each other’s ideas, even if what’s suggested doesn’t turn out to be all that funny. Those riffs can also occur when Colbert and Stack converse on camera, as when Colbert looks heavenward to speak with God, the animated character whose mouth moves to Stack’s voice-over. In one February sketch, Colbert asks God about the NRA president’s contention that gun ownership was a right granted from on high. Colbert wonders if God is pro-gun. At 53, Stack is tall and lanky, with a full head of red hair that can be slicked back and neatly combed on air. It’s somewhat untamed when he shows up to speak in late October at the Hudson Valley Writers Center in Sleepy Hollow, not far from his home. He’s around the same age as O’Brien and Colbert, part of the late 1980s and early 1990s generation that found inspiration in Chicago during what Stack likes to call the golden age for improv comedy, when he found his comedic voice alongside future stars Colbert, Steve Carell, Amy Poehler, and Tina Fey. Dressed in a gray button-down shirt with gray slacks and black suit jacket, he talks about how Americans may not stay up until midnight to watch his latest sketches. But many of his fans watch regularly on short clips that run a minute or two and get shared on Facebook or Twitter. Colbert’s writing staff includes a slew of young writers, whom Stack says he relies on at times to keep himself up to date. That’s not to say that Stack shuns social media. He has more than 33,000 Twitter followers at @BrianStack153. A recent header photo depicted him in a goatee, mustache, and glasses, intently reading a volume titled Things Only Weenies Care About . Stack’s comedic journey began at the Ark Theatre in Madison, located in a converted garage on Bassett Street. A graduate of Indiana University, Stack had taken a comedy improvisation workshop in Chicago in the summer of 1986. He arrived in Madison that fall to pursue a master’s in communication arts, delving into the psychology of media and contemplating a career in academia or advertising. In Madison, he mustered up the courage to audition at the Ark to give comedy a shot while hitting the books for his graduate studies. Among those in the company were up-and-coming comic Chris Farley and longtime Onion writer Todd Hanson x’90. At the time, Stack couldn’t imagine a way to make money making people laugh. After graduation, he moved back home to Chicago to work for four years in an ad agency. But comedy still beckoned, so he performed improv for fun on weekends. That became a moot point after he landed a job with the touring company of Second City. Comedy led to romance, too. He met his wife, Miriam Tolan, in a Chicago improv ensemble called Jazz Freddy. They worked together at Second City, got married, and have two daughters, Nora, 20, and Colette, 16. After four years at Second City, Stack had his big break, joining the writing staff at Late Night with Conan O’Brien for what was to be a 13-week stint. A sketch he wrote for Amy Poehler, with her playing a 13-year-old, helped convince the powers at NBC to extend his contract. His fill-in gig turned into 12 years with O’Brien’s show on NBC, and another five years after O’Brien moved to TBS. It was a run that led to five Writers Guild Awards for Writing in a Comedy/Variety Series and an Emmy award in 2007. That first year on Late Night wasn’t easy. Stack recalls the December day that O’Brien walked grim-faced into the writers’ room. He told them that Chris Farley was dead, at age 33. Although Stack’s sense of loss has lingered to this day, he continued to hone the sense of comedy that has landed him on late-night’s most highly rated talk show. Stack isn’t the only Badger contributing to Colbert’s signature brand of laughs. Gabe Gronli ’04 and Aaron Cohen ’03, who had worked as interns with Stack at Late Night with Conan O’Brien , moved to CBS to join the writing staff with Stack when The Late Show with Stephen Colbert debuted in 2015. Cohen, now a writer and supervising producer for Colbert’s show, marvels at Stack’s range. Gronli, one of the Late Show ’s writers, grew up on Madison’s west side. He remembers the first day of his Conan internship, when he met Stack, whom he calls the friendliest person he’s met during his television career. Gronli says Stack has an uncanny ability to create characters, each with a distinct point of view and mannerisms to match. This all comes out in the collaborative writing process, which Gronli says occasionally circles back to Madison. Stack believes that his knack for writing emanates from his training in improv, which he still performs monthly in Manhattan at the Upright Citizens Brigade show Gravid Water . The show features experienced stage actors who recite lines from a play, with the improvisor, who hasn’t read the script, responding to lines they’ve heard for the first time. In late February, Stack adopts a deadpan British accent in a scene from the play Mary Page Marlowe . It’s a scene in which a husband faces allegations of infidelity from his wife. Stack’s character brushes off the allegations, but his disinterest in the marriage is revealed. The audience erupts in laughter after Stack tells his estranged wife that he’ll watch over their baby — whose name he can’t remember. 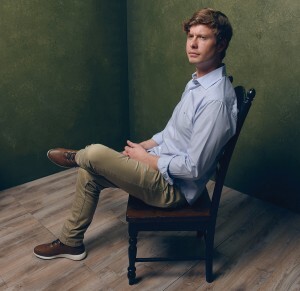 Anders Holm ’03 was in New Orleans when he got a call from his manager about a job opportunity. The following day, sitting in his hotel room, Holm auditioned for The Intern via Skype. Hours later, he was on a flight to New York City to meet with the movie’s director, Nancy Meyers, and its stars, Anne Hathaway and Robert De Niro. And that, as Holm puts it, “was that.” He nailed the audition and landed the job. Garnering a starring role opposite megastars in a Warner Brothers romantic comedy is just the latest career triumph for Holm, who grew up in Evanston, Illinois. Since moving to Los Angeles twelve years ago, he’s made a name for himself in a town known for its cutthroat mentality. Holm’s real-life Cinderella story began five years ago when Comedy Central greenlit Workaholics, a series the thirty-four-year-old co-created, produced, and wrote with Blake Anderson, Adam Devine, and Kyle Newacheck. The single-camera comedy centers around three slackers (played by Holm, Anderson, and Devine) who “work” at a telemarketing company during the day and party at night. The underachieving trio proved an instant hit with viewers. The show and its go-getter stars also caught the attention of Hollywood. Since the 2011 debut of Workaholics, Holm landed a recurring part in Mindy Kaling’s television series The Mindy Project , as well as a slew of highly coveted small roles in major Hollywood films, including Inherent Vice, The Interview , and Top Five . And while Holm is best known for his improv and absurd comedy, he earned unexpected praise at 2015’s Sundance Film Festival for his dramatic acting chops in Unexpected , an independent film about an unlikely friendship. The writer-actor closed out 2015 on a high note both personally and professionally. In December, Holm and his college-sweetheart-turned-wife, Emma Nesper ’04, celebrated their son’s second birthday. That was preceded by The Intern’s splashy Manhattan premiere; news that Comedy Central extended Workaholics for a sixth and seventh season; winning yet another noteworthy role in a Hollywood romantic comedy, How to Be Single , starring Rebel Wilson and Dakota Johnson; and being chosen to write a screenplay for a project that he’s developing with Seth Rogen. But Holm is quick to point out that while his rise in the entertainment industry came quickly, it certainly didn’t happen overnight. His big breaks in both television and film required the Roman philosopher Seneca’s recipe for luck — loads of preparation paired with opportunity. 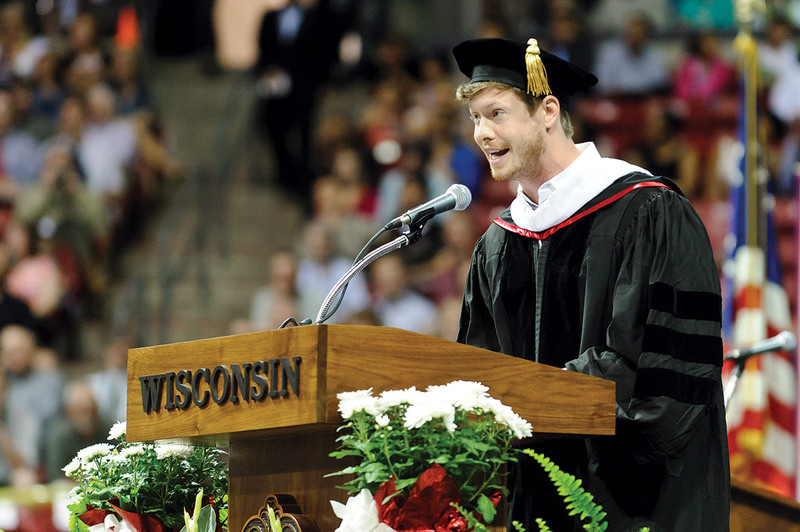 Holm’s preparation began during his college years at UW–Madison, where he was a member of the varsity swim team and majored in history. In between the 50-meter freestyle, homework, and hanging out with friends at the Essen Haus, Holm wrote screenplays. A lot of screenplays. The effort paid off. One year after graduation and nine months after moving to Los Angeles, Holm landed an internship at power producer Barry Josephson’s Josephson Entertainment. That led to a meeting with Bones creator Hart Hanson, who, after looking at some of Holm’s screenplays, hired him as a writer’s assistant. It was while working on Bones that the actor had a revelation. While Holm never planned on becoming an actor, he soon found out that as a comedy writer, the quickest way to prove to people that his words were funny was to perform his own material. In 2005, right before starting a job as an assistant on HBO’s Real Time with Bill Maher , Holm met his soon-to-be Workaholics co-stars Devine and Anderson while performing at the renowned sketch-comedy group Second City LA. In 2006, the trio, along with Kyle Newacheck, formed Mail Order Comedy — a group devoted to writing material, performing at various venues, and filming their own skits, which they uploaded to YouTube. Cut to 2011. After viewing their online content, an executive at Comedy Central approached the group to make a pilot. While Holm considers that call a highlight in his career, he doesn’t regard it as his “I made it” moment. That came a few months later, when Comedy Central ordered a second season of Workaholics before season one had even aired.